(PRLEAP.COM) Medical Tourism Association (MTA) awarded certification to Ron Elli, PhD, the founder and president of Mexico Bariatric Center (MBC). Dr. Elli demonstrates his commitment to industry best practices and patient care by becoming a certified member of the Medical Tourism Association. Ron Elli, PhD, an expert in the medical tourism field, has been successfully implementing and managing bariatric medical tourism program in Mexico. "Mexico Bariatric Center will continue to adapt to the quickly-changing medical tourism field," says Ron Elli, PhD. "We'll continue to guide patients from around the world find qualified bariatric surgeons at affordable price," Ron Elli, PhD continues. "For the the past year now, we've been strictly focusing on bariatric and metabolic surgeries, and now we're transition into plastic and cosmetic surgeries in Mexico. 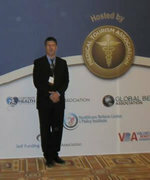 So it makes sense to have our company accredited by Medical Tourism Association," says Ron Elli, PhD. The Medical Tourism Association (MTA) is the official medical tourism organization for the top international hospitals, healthcare providers, medical travel facilitators, insurance companies and other affiliated companies. 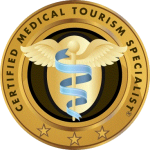 Medical Tourism Association offers its members the option to become a Certified Medical Tourism Professional (CMTP). To become a CMTP, professionals must have three years of experience, must have commitment to advanced and continuing education and must take an exam to demonstrate medical tourism knowledge. Ron Elli, PhD, founded Mexico Bariatric Center (MBC), a medical tourism facilitator focusing on patient experience. Ron Elli, PhD has been a regular attendee of Medical Tourism Association congress, including the 6th World Medical Tourism Congress held in Las Vegas Nov 2-6th, 2013. Mexico Bariatric Center is a healthcare facilitator, helping patients undergo specialized and inexpensive bariatric surgery in Mexico. MBC operates its healthcare centers in Tijuana, Puerto Vallarta and Guadalajara. Mexico Bariatric Center has helped hundreds of patients in the past year fight obesity, and become healthy. Since its inception in 2011, Mexico Bariatric Center only works with the top healthcare providers in Mexico. Mexico Bariatric Center strives on five key areas: medical quality, patient experience & care, locations, communication and pricing. With our mission, we've become the leader in Mexico bariatric surgeries, and will continue to thrive tomorrow.